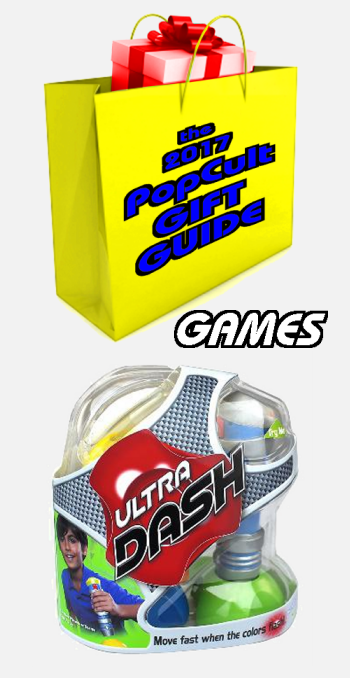 Our game pick for today’s 2017 PopCult Gift Guide is called Ultra Dash, and it’s a terrific electronic activity game for kids six and up that let’s them burn off a little steam, instead of sitting in front of a television or around a board. This is perfect for the kid on your shopping list who likes to be active while they’re playing. Ultra Dash consists of an electronic baton, or “tagger” that comes with five target bases. Kids have to rush to tag the base that corresponds to the color that the baton flashes. Players get a thrilling rush of excitement as they race to match the color of the flashing light on their tagger to the color of the targets. it’s a fun way to get kids, as well as adults, up and moving. Each time you play it’s a different game because the order of color flashes randomizes, plus you can rearrange the target course however you want. Ultra Dash could also be exactly what the doctor ordered for a great family activity during our society’s much needed screen-free time. Ultra Dash has three game modes: Beat the Clock is a race to hit all five targets and see which player is fastest; Target Tally allows players to choose their time and then race to see how many targets they can hit in that time; and Relay Race is team vs. team, with each player racing to hit five targets and then passing their tagger to the next player. The first two games can be played as single player, with kids trying to beat their own time or target-count. There’s an element of the game “tag” here, but with a fun new electronic twist. Plus, kids can play solo, which is hard to do when you’re just playing tag. I’ve tried it. It’s not fun.